Some factors, like heavy turnout, are beyond the board’s control. Even as digital delivery has streamlined election returns in recent years, Dare has lagged behind neighboring counties in posting results online. So the Dare County Board of Elections has decided to do something about it. 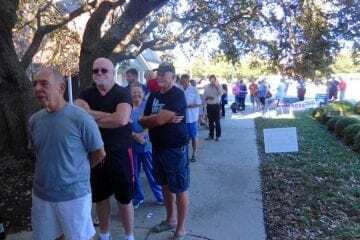 “One of the complaints we’ve received is how long it takes for the returns to be posted,” Dare County Board of Elections member Virginia Tillett said. On Tuesday, the board unanimously approved a plan to swear in Dare County deputies as election officials to shuttle results via flash drive from each polling place to the Board of Elections headquarters in Manteo. Carteret and Wake counties use this approach. “We’ve used this method for many years,” said Shawne Southard, interim Board of Elections director for Carteret County. Southard said that for the upcoming primary, Carteret will use four or five deputies to deliver election results from 16 precincts. “It has been a work-in-progress as we have looked for ways to do this while complying with state law,” said Sandy Semans Ross, chair of the Dare County Board of Elections. Provisions under the North Carolina Administrative code allow for this form of delivery. Specifically, 08 NCAC 10B .0105(m), stipulates that the Chief Judge of each precinct shall bring or have delivered by secure means, the results cartridge to the board of elections office. But doubts regarding the use of deputies to deliver the flash drives have been voiced, and since the board’s meeting the approach has changed. “I was concerned about the chain of custody,” said Sheriff Doug Doughtie. Doughtie, worried about a deputy being solely responsible for transporting election results, offered a new solution. Instead of the deputies delivering the results, they would give a poll worker with the flash drive a ride to election headquarters, then return the worker to the polling site. “We can’t express just how much we appreciate Sheriff Doughtie’s willingness to work with us on this and help us find the most transparent and legal way to make it happen,” said Ross. The new solution will be voted on at the board’s next meeting.